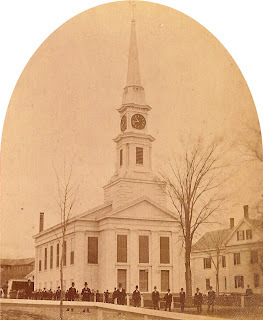 On Memorial Day, as fire gutted a large portion of the historic Central Congregational Church on South Main Street, onlookers stood watching in shock and disbelief while flames licked at the base of the steeple, threatening to consume the church which for so many held a deeply-rooted connection to the Town of Middleborough and its history. Despite the disturbing novelty of the scene, it was one which had been witnessed previously in Middleborough, over 120 years earlier when fire utterly destroyed the Central Baptist Church. The original Central Baptist Church had been constructed on the site of the present building on Nickerson Avenue in 1828, the culmination of a long effort by local church leaders to establish their own church in the then burgeoning Four Corners area. The church, which replaced an earlier chapel used by the parish, was a symbol of the aspirations of the local Baptist community which had been so influential in the growth of Middleborough center. Until 1847 when the Central Congregational Society was formed, the Central Baptist Church remained the sole church at Middleborough Center. Accordingly in those nearly twenty years, it established for itself a primacy of place within the lives of local residents, many of whom were members of the parish and all of whom, in time, would have a connection with the building. That connection came in 1847 when the identity of Four Corners residents was wedded to the church with the installation of a town clock in the church steeple, an action undertaken at the behest of the town which sought to use the church’s steeple as the highest structure then at Middleborough Center. 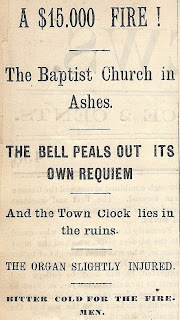 Little appreciation, however, was probably given the clock until the bitterly cold afternoon of January 22, 1888, when the church was destroyed by fire, and the town clock with it. Conflicting reports remain regarding who first noticed the fire which was later attributed to an overheated chimney. Mrs. Elisha T. Jenks, then inside the building with the Sunday School class, is said to have reported the fire after she saw smoke blowing past the window. Another report states that it was a different member of the class who smelled smoke and upon investigating discovered the blaze. About 12.10 o'clock p. m., a member of the Sunday school smeled what he thought was burning wood, and went into the ante-room, where he saw a hole burned through the wall. He told others and in going up stairs the flame could be ssen through the ventilators in the ceiling where the chandeliers hung. Still other reports indicate that it was actually Mark Merrick, an engineer at the H. L. Thatcher print shop directly opposite the church on Thatcher’s Row who noticed smoke rising not out of the chimney on the northwest corner of the building but from beside it which prompted him to run to the engine house on School Street to seek the assistance of the local firemen. While the Sunday School was being immediately evacuated from the church, Merrick was apparently having some difficulty in convincing the firemen of the gravity of the situation and they are reported as having been “at first rather incredulous”. Nonetheless, the engine responded (though drawing it even the short distance was difficult given the snow which covered the ground) and with five and a half minutes a chemical stream was applied to the building and within ten minutes a stream of water. Water was played upon the roof around the chimney, but by that time, the fire had spread the entire length of the building between the ceiling and the roof. Dense smoke and intense heat beat back firefighters who, unable to quench the flames focused on saving adjoining buildings, including the former Peirce Academy building and Thatcher’s print shop. Embers drifted as far as South Main Street, momentarily setting the roof of Charles Drake’s House (on the site of the Mayflower Bank) ablaze. Ice and freezing temperatures made the task of firemen particularly difficult and especially dangerous. One firefighter, Alonzo Norris, was injured "by the falling of a hose nozzle, cutting a severe scalp wound, but no serious results are apprehended. A few days of confinement will probably bring him around all right. One or two others were somewhat bruised but not seriously." Disregarding the temperature, crowds gathered along Center Street and in the rear of the Town Hall to observe the destruction of the church with the most dramatic moment being the crashing in of the 128 foot high steeple, weighted with both bell and town clock. Later, the local fire department would come into some criticism for their conduct of operations at the scene of the fire. While the exact nature of the complaints lodged against the firefighters has not been left on record, a spirited rebuttal to the criticism has. MR. EDITOR: - In your edition of Monday, 23d, it was quoted from good authority that it was full thirty minutes before a stream of water was put on to the fire. Now that is a base falsehood. From the time the alarm was sounded to getting a chemical stream on was 5 1-2 minutes and a water stream on in 10 minutes. These are the facts that can be proven if required. 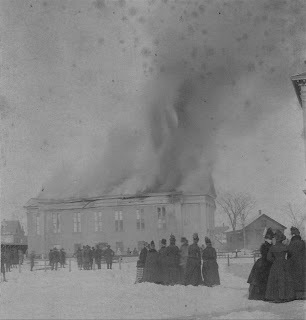 The church inside the walls was a mass of flames before the alarm was given and before the Sunday school was dismissed. The fire must have been burning for hours. The firemen worked with a will and tried every possible plan inside and out to stop the flames. With the thermometer at zero and men, hose and ladders covered with ice it was a dangerous and difficult task. People may stand and look at a building on fire and suggest some plan to put the fire out, but let them attempt the task and they will not do any better if as well as others have done. The firemen deserve great credit for the manner in which they handled this fire. We can justly say "thy will be done," not mine. A meeting of the [Central Baptist] society will be called at once to consider what course to adopt. There is little doubt that the church will be rebuilt, and probably upon the same spot. We understand that offers of accommodations for meeting have been given by both the [Central] Congregational and [Central] Methodist societies. at the meeting Monday evening of the Baptist church committee and the prudential committee of the society, an appreciative vote of thanks was extended to the Congregational and Methodist churches for their kind invitations to worship with them while the baptists were deprived of a house of worship. Below is a copy of the circular which is sent out by these two committee to the members of the church and congregation and those who are interested in the question of rebuilding. "Dear Friend: The ruins of our church home, with touching eloquence, now plead with us to remember the work and sacred influences for which it stood so long, and the silent tongue of the bell call us to speak...."
Perhaps the earliest photograph of a building fire at Middleborough, this view depicts the crowd that has assembled in the rear of Middleborough Town Hall to witness the destruction of the Central Baptist Church on Sunday, January 22, 1888, just after noon. The loss of the church and the town clock it housed was a devastating blow for the community. "...The photograph itself was taken by Fletcher L. Barrows, who made three or four good negatives of different stages of the fire. One of them shows the steeple as it fell and the set make a fair start toward a motion picture of the event. Amateur photography was then in its infancy and the results even today  may be called good. Another unique result of the fire was the fact that sfter the flames were through with their work, the organ could be played to some extent. The progress of the fire was from the rear of the church or organ loft toward the steeple which acted as a chimney for draft" [Middleboro Gazette, "ye NB colyum", May 2, 1924, p. 1]. The view depicts the Central Baptist Church a short time before the 1888 fire. Both the Middleboro News and its friendly rival, the Middleboro Gazette, would have devoted extensive coverage to the fire, though only this clipping from the News appears to have survived. 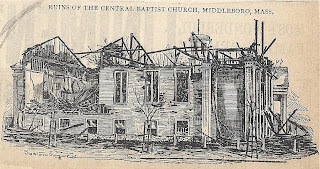 This illustration from an unidentified Boston newspaper at the time of the fire depicts the remains of the Central Baptist Church which was entirely destroyed.